This is my story. . . My friend Kaika, Kihei Boy, called me up and said, We go fish uluas. I get fresh, blinky tako, the tide is on the rise, the kids no more school, and theres no moon. I told him, Shoots, I pau work at 3:30. Meet you at your Papas house. We met up and then headed to the spot. We started setting up and putting out some lines while the kids were body surfing. The sun went down as the last line went out. A little time passed. I decided to check on the trucks while Kaika started the barbecue. On my way back I heard, Ding, ding! Zzzzzzzzzzaaaaaaahhhhhhhhh! I ran, jumped some stairs and tourists, and dashed to my pole. The fight was on! All of a sudden, my other pole went off. The fish snagged it, and it still wasnt stopping. Kaika and I looked at each other and said, Gotta be one big tiger shark, cause shes screaming two poles. She made two big runs before she snagged the line. I felt head shaking as she swam toward the reef. Kaika went over to shine light, and she instantly swam back to the right. I screamed, Ulua! and started boosting her in. I looked at my reel and could tell she was close. My son, Kayden, and Kaikas son, Javan, brought the gaff to Kaika. They shined light, and all we could see was a monstah in the wave. 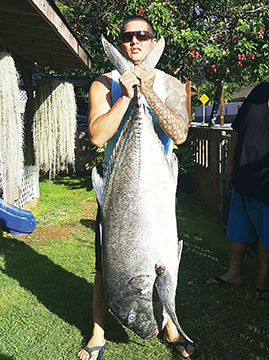 Kaika rushed in, gave her one pro gaff job right in the gill plate and brought her to shore at around 7:35 p.m. The celebration was on. We were screaming, yelling and calling everyone we knew. As our families headed down, we were trying to tell them how big it was. Is it hundred? Is it not?